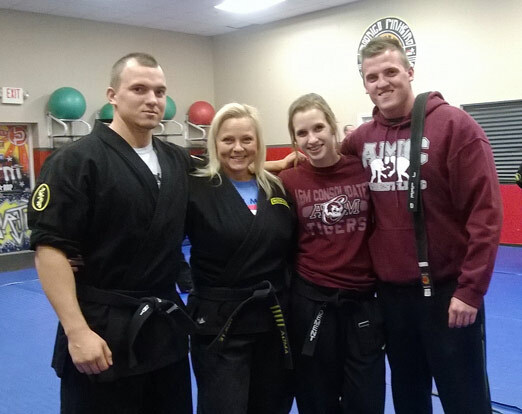 Master Nolte has combined practical self defense and traditional martial arts training together for a full well rounded martial arts experience. Her program is for all ages 6 -13 years and there is something for all personalities to enjoy and learn. Some kids are competitive in sports, your child may compete with this system. Others may want to focus mainly on self-defense, this program is cutting edge on self defense. 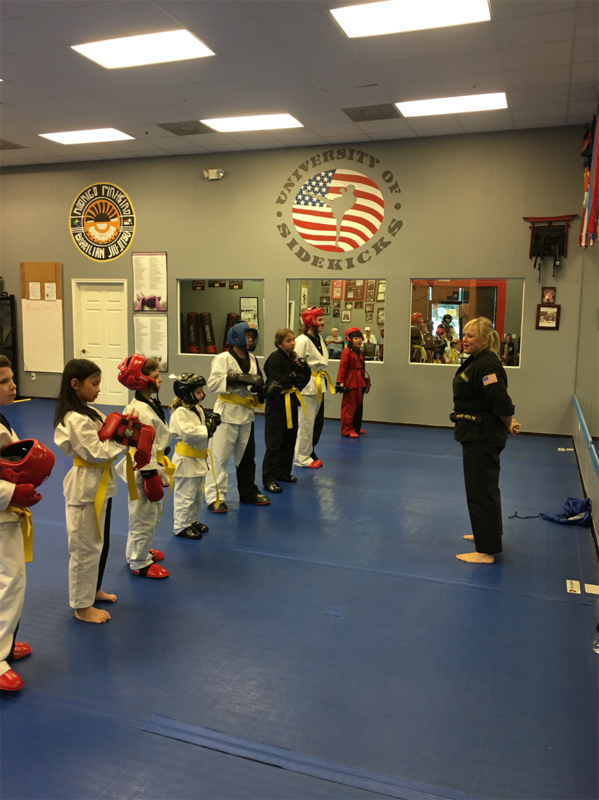 We also share leadership principles, fitness, and discipline together to make the Youth International Self Defense System (ISDS) an activity you want your child involved in and is highly needed in this day and age. The system includes disciplines such as sport Karate, Tae Kwon Do, Judo, Small Circle Jiu-Jitsu from Modern Arnis, Israeli Krav Maga and Keysi Fight Method. Our Youth International Self Defense System I.S.D.S. is a Black Belt Program. The curriculum is divided into 4 segments that rotate each month so to make sure every child gets exposed to the skills and knowledge. The system is presented in a rotation 3x a year, each time with a new or more challenging and or new expectations/curriculum. The rotations start at the beginning of the year, end of the school year and lastly the beginning of the new school year. Beginner students may be eligible to rank test 3x in 1 year where as intermediate and advanced students may be eligible to rank test once or twice in a year. The students are required to keep a 3 ring binder and take notes, keep handouts, keep a copy of rank certificate, and keep a record of there progress. These notebooks are handy training aides and tools that help move the student forward. We encourage students to write down goals and work to accomplish them. We also encourage students to do well in school not just do there best academically but also to be a good student and a good friend and good example to others. Becoming a Black Belt leader is our goal at University of Sidekicks. Our ISDS aims to support principled centered living, for example: a block means discipline, a bow means respect and courtesy, attention means self-control, etc. Goal setting, respect, and self-esteem go hand in hand along with learning how to punch, kick, and block. Disciplines of martial arts are fundamentals of life. Recognition and patches are awarded to students when tasks are completed. Just as an Eagle Scout will earn merit badges for completing tasks and accomplishing goals so do our students. A Black Belt is a long term goal with many intermediate goals, short term goals and long range goals along the way. Classes meet 4x a week. An average student across the nation trains 2x a week in a martial art program, so the commitment is up to the individual, naturally the more you attend the greater chance to retain the material and learn even more, each class is 45 minutes in length. The Sport of JiuJitsu is also one of the greatest forms of exercise, discipline and self defense! We start them young! At age 3 they are learning bully proof ways to avoid being taken to the ground, how to escape and maneuver out of difficult position and even how to submit the opponent. The Mighty Mites class is about 30 minutes for ages 3-5. Youth BJJ is a 1 hour class, age 6-13. 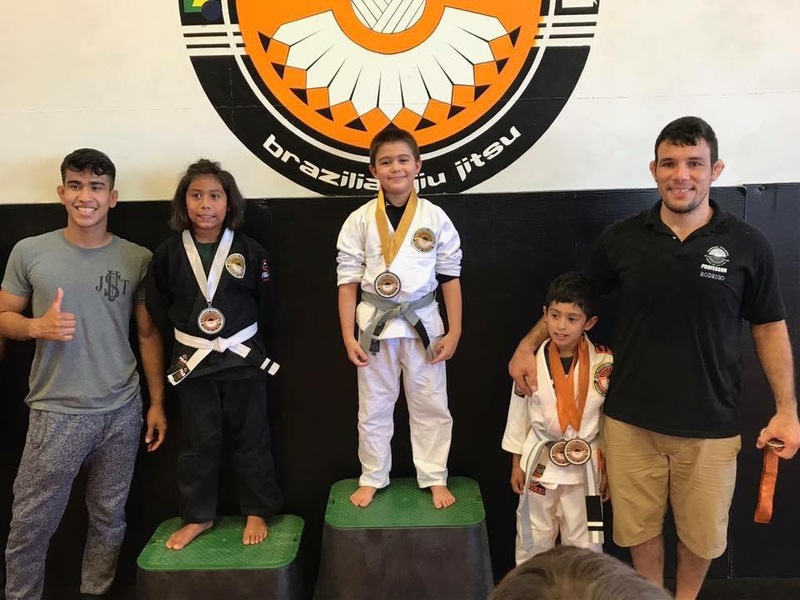 The students have an opportunity to train with Professor Rodrigo Pinheiro at his seminars here at Sidekicks, or the invitation is open for our children to train at his other locations in the San Antonio are when they are in his neck of the woods. The youth JiuJitsu ranking system here at Sidekicks is every 22 classes the youth receives a stripe, we follow the Official International Brazilian JiuJItsu Federation (IBJJF) ranking system. Professor Nolte and Professor Pinheiro both hold In-House tournaments where the students can come together and have a friendly competition a couple times a year, usually in the late Spring and Summer months. JiuJitsu also teaches your child self control, respect, loyalty, discipline, honor and family. JiuJitsu is not just a martial art sport but it is a community and can be a way of life. We strive to ensure a safe and enjoyable training and learning experience. JiuJitsu is one of our more physically demanding classes, kiddos will definitley get a great work out, a healthy routine that builds muscle, stamina, brain integration, and core. Besides learning coordination, flexibility, agility, JiuJitsu is a huge self-defense program. We follow the Gracie Black Belt System and Professor Nolte has been part of Gracie Barra, Pedro Sauer, Chad Kight JiuJitsu and Rodrigo Pinheiro JiuJitsu Systems to develop and fine tune her skills to bring them to your family and the community. Modern Arnis is part of our self defense programs for family and adult. Modern Arnis (Filipino Martial Arts with an emphasis on stick, knife, empty hand, and small circle JiuJitsu) is a large part of our GSDS & Youth ISDS. We offer special classes, private lessons, seminars, and workshops for those who want to train in Arnis independently. The International Modern Arnis Federation was founded by the late Grandmaster Remy Amador Presas. The Modern Arnis practitioner will learn self-discovery and self-control, achieve personal excellence, and gain self-mastery in the face of life’s daily uncertainties, challenges, and opportunities. Training covers empty-hand self-defense (striking, locking, throwing, etc.) as well as the trademark single and double stick techniques of the Filipino Martial Arts. Other aspects of the art include espada y daga (sword and dagger fighting), sinawali (double stick weaving patterns), and tapi-tapi (locking drills with the stick). In addition to partner drills, Modern Arnis includes the use of anyo (kata), solo forms both with and without the stick. Emphasis is placed on fitting the art in with a student’s previous training (“the art within your art”), smoothly reacting to changing situations in the fight (“the flow”), and countering the opponent’s attempt to counter strikes directed at him (“tapi-tapi”). Practitioners are called arnisadors or Modern Arnis players. Master Nolte is a Certified IMAF Instructor and Licensed School. Master Nolte trained under the Professor before he passed. Currently her mentors in Modern Arnis are Master of Tapi-Tapi Dr. Randi Schea, Datu Shishir Inocalla, and Master Earl Tullis. Signup for a FREE trial class!